This kit provides permanent, instant field repairs to Therm-A-Rest® & other self-inflating mattresses, sleeping pads, boots and shoes, outerwear, tents, packs and more. Works on fabrics (non-silicone treated), leather and many other materials. 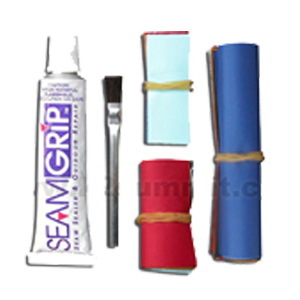 Kit includes: 1 SeamGrip Urethane Adhesive, 1 Application Brush, assorted colour tape patches.